The DC Eagle Cam relaunches on December 31, 2017, just in time to ring in the New Year. Pictured here are bald eagle pair Mr. President and The First Lady inside their nest atop a Tulip Poplar Tree, preparing for another breeding and nesting season at the National Arboretum in Washington, D.C.
WASHINGTON, D.C. – The time has arrived for the stars of the DC Eagle Cam to return to their wild nest and reality nature show on the World Wide Web, just in time to ring in the New Year! During 2017, eagle fans from around the world watched Mr. President & The First Lady raise two more eaglets inside their nest atop a Tulip Poplar tree inside the U.S. National Arboretum (USNA) live at www.dceaglecam.org. 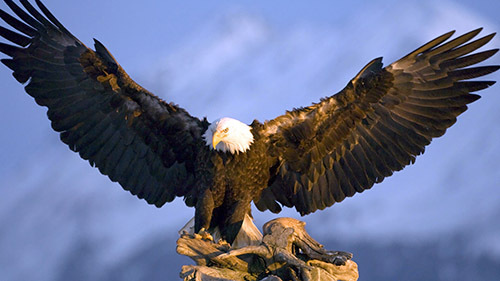 With more than 94 million views since its inception in 2016, the DC Eagle Cam is now one of the most popular live animal cams on the Internet today- with viewers from 109 countries, including the United States, Canada, Germany, United Kingdom, Australia, Brazil, Belgium, Netherlands, Ireland, Poland, and Russia. During the upcoming 2018 nesting season, millions of viewers can anticipate an even more exciting eagle nest cam experience. 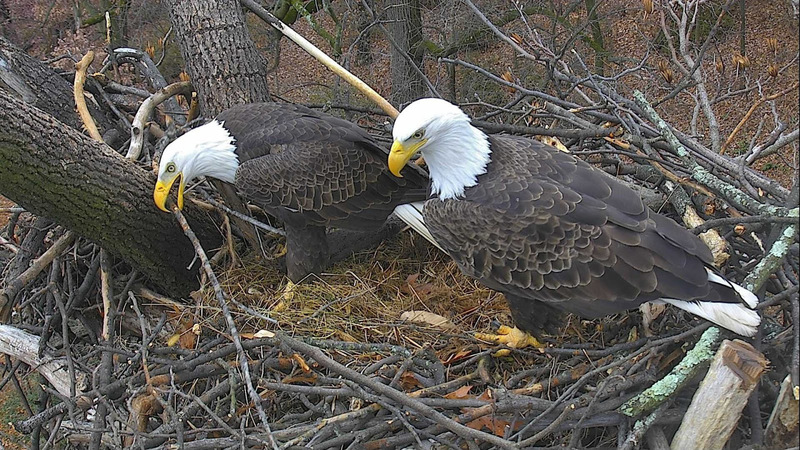 The DC Eagle Cam now boasts high-quality images and sound! In August 2017, after all four eagles (parents and two young) left their Arboretum nesting area, the not-for-profit American Eagle Foundation (AEF, www.eagles.org) and its audio/video tech team and arborist tree-climbers traveled to the National Arboretum in Washington, D.C. to install two new high-definition ‘pan-tilt-zoom’ axis cameras, as well as new microphones in and around the nest tree. After the 2017 nesting season concluded, Mr. President decided to remain in the DC area throughout the summer as he patiently awaited The First Lady to return. When she returned on September 28, they both have been tirelessly carrying out nest building activities (“nestorations”), adding hundreds of sticks and other soft materials to the interior of nest. Throughout the upcoming nesting season, DC Eagle Cam viewers will be able to participate in live Q&A sessions with the AEF’s team of volunteer moderators. Live Q&A sessions will be continually scheduled throughout the 2018 breeding and nesting season, which will commence on January 15. There will be a bonus Q&A session on December 31 from 12 p.m.-2 p.m. EST. Schools also may schedule special times to view the nest live from within their classrooms and to ask the AEF moderators educational questions directly. In 2015, American Eagle Foundation staff traveled to D.C. to install state-of-the-art cameras, infrared lighting, microphones and other related equipment in-and-around the nest tree with the help of volunteers, tech professionals and experienced arborist tree climbers. The USDA’s U.S. National Arboretum ran a half-mile of fiber optic cable to the AEF’s audio/video ground control station, which connects the video cameras and microphone sound to the Internet. The entire system is powered by a large mobile solar array (containing several deep cycle batteries) that was designed and built by students and staff from Alfred State College, SUNY College of Technology and was partially funded by the Department of Energy and Environment. USNA has implemented a backup generator that will kick on if prolonged inclement weather causes the solar array to provide insufficient power to the system. In 2016, APEX Electric Inc. (Kenmore, Washington) traveled to DC to also assist the AEF in successfully installing audio and video equipment and cabling.